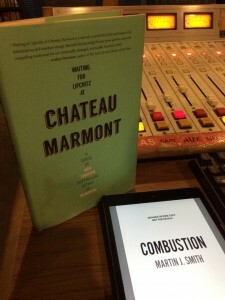 Martin J. Smith, author of Combustion, and Aris Janigian, author of Waiting for Lipchitz at Chateau Marmont talk with Barbara about plotting (or not), creating suspense, publishing with a small press, and more. This entry was posted in Writers on Writing, Writers on Writing Episode. Bookmark the permalink.